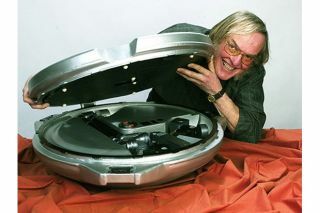 British planetary scientist Colin Pillinger poses with the Beagle 2 Mars Lander ahead of the spacecraft's attempted landing in 2003. PARIS — British planetary scientist Colin Pillinger, whose single-minded determination all but forced the European Space Agency to launch the ill-fated Beagle 2 lander to Mars in 2003, is dead at 70, according to the Open University, where he was a long-time professor. The cause was a cerebral hemorrhage. Pillinger, with his mad-scientist’s hair and sideburns, was Beagle 2's ubiquitous public face and the project's prime mover. The mission had several near-death experiences in development and it was with some resentment that ESA agreed to carry the lander on the larger Mars Express orbiter mission. Beagle 2 began and was maintained on a shoestring budget. But it ultimately elicited the kind of public support, in Britain and around the world, that few missions ever achieve. ESA's Mars Express has produced spectacular pictures of Mars for a decade. But for a time, Mars Express was almost an afterthought as Beagle 2’s fate — a likely crash on Mars — captured the world’s attention during Christmas 2003. ESA and British officials said afterward that while Beagle 2 never functioned as a mission to search for Martian life, it was an unqualified success in raising public awareness for science and technology, and specifically for space exploration. Pillinger's sharply drawn personality was key to Beagle 2 and helped turn a technical failure into a public relations success. ESA has since made the search for life a prime goal of its ExoMars missions, planned for launch in 2016 and 2018. "Do it! It is absolutely phenomenal training for anybody, even if they never get involved in another space mission in their lives. The training you get, and the thought processes you develop, will stand you in good stead whatever you do in later life, whether you are a bricklayer or a barrister!"